Powers/Abilities: Time Traveler(s) is/are a manifestation of the Enigma Force, the semi-sentient energy that permeates the Microverse. The Enigma Force is the universal power that binds the very molecules of the Microverse together. It is what keeps the Microverse separate from the Earth dimension, preventing the two dimensions from annihilating each other. They are the forms the Enigma Force typically uses to interact with physical beings. While bound to Arcturus Rann's mind they were much more prone to acting against evil, but since their separation from Rann they have generally refused to involve themselves with mortal affairs. The current status of the Enigma Force and the Time Traveler(s) following the resolution of the pain, and then the later merging of the Microverse with other subatomic realms remains uncertain. The Uni-Power is another manifestation of the Enigma Force, which grants power to beings in the Microverse, in the Earth dimension, and presumably elsewhere to accomplish certain acts, almost always benevolent in nature. See individual Captain Universes for further details. The Shadow Priests were so named because while the Time Travelers were filled with the light of the Enigma Force, the Priests themselves were mere servants of the light...shadows cast by a greater glory. The Herald comet appears to be a Time Traveler making its presence known by soaring through the sky, taking on the appearance of a comet. Please read the Makers profile prior to reading this one. (Micronauts II#13 (fb) - BTS / Micronauts II#14 (fb) - BTS) - The Wanderers, the people of Prince Wayfinder, were souls from the scattered universes of infinity, incredibly diverse with but one thing in common--the DNA code of life. The Makers brought Wayfinder and the Wanderers to the Microverse, using them to populate the Spiral Path, to give life and meaning to the structure they had created. They intended the beings populating the Microverse to be champions of the life that they intended for their universe. (Micronauts I#35 (fb) - BTS) - Millions of years ago (see comments), Prince Wayfinder led his people, the Wanderers, to Earth, intending to make it their home. However, at the time Earth (or at least the part they landed in) was ruled by Whirldemons, who resented the newcomers and attacked them. (Micronauts I#31 (fb) - BTS) - While his allies engaged the Whirldemons, Wayfinder communed with the Sword in the Star, asking it for help. The Sword transformed Wayfinder and his people, filling them with its own awesome power and allowing them to pass safely from Earth into some subatomic solar system. (Micronauts I#35 (fb)) - The Sword in the Star transformed Wayfinder into the first Time Traveler, and he used his new power to bind the Whirldemons so they could not escape. By the power of the Enigma Force, the Microverse was brought into being, and it was populated by Wanderers. (Micronauts I#34 (fb) - BTS) - Between the newly created Microverse and the Earth dimension, Wayfinder/Time Traveler created a barrier known as the Spacewall. (Micronauts I#31-35 (fb) - BTS) - The tomb (or perhaps just a monument) to Wayfinder and the Wanderers was established on Deadzone, part of Microverse's Homeworld. The Sword in the Star either placed itself within the tomb, or established a failsafe, such that should the Enigma Force ever become incapacitated, the Sword in the Star would be re-formed within Wayfinder's tomb. It further created three "Keys to the Enigma Force," which could unlock Wayfinder's tomb and release the Sword to restore the Enigma Force. The secret lies in these keys three!" (Micronauts I#7 (fb) - BTS) <1000 years ago> - Arcturus Rann departed Homeworld alongside the roboid Biotron aboard the H.M.S. (Homeworld Micro-Ship) Endeavor on a millennium long mission to explore the Microverse. 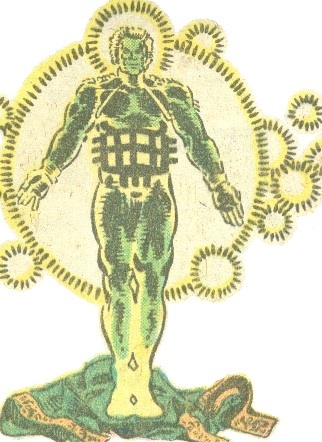 While Rann's body slept, Biotron bore his telepathic message of peace to the denizens of countless worlds. (Micronauts I#30 (fb) - BTS) - The Enigma Force created the Time Travelers as energy entities based on Rann's brain patterns as he voyaged in suspended animation. Their purpose was to watch over the inhabitants of the Microverse, to warn them of danger, and to protect them against that which could destroy them. (Micronauts I#8 (fb) - BTS) - Baron Karza initiated his wars of conquest. When Homeworld's regent, Lord Dallan Rann and Lady Sepsis, refused to publicly sanction Karza's wars, Karza had them dragged to his Body Banks and slain. Dallan and Sepsis became symbols of the rebellion, and it was whispered that on some far off day, their son, Arcturus, would return to avenge them and to deliver Homeworld from the oppressor. (Micronauts I#8 (fb)) - Time Traveler founded the secret holy order of the Shadow Priests, who pretended to serve Karza while secretly fomenting rebellion. They labored to create a network of rebellion in the Shadow Temples, spreading news to the "faithful" as they gambled at Karza's life machines. The Shadow Priests bided their time, waiting for the day when Karza would leave Homeworld unguarded. (Micronauts I#47 (fb)) - The Sylosians took to space in their immense Bioship. They encountered and breached the Spacewall, but they were mutated by the experience. They arrived on Earth in the form of life-energy draining vampiric creatures. (Micronauts I#31 (fb) - BTS) - As the Herald Comet (a manifestation of Time Traveler) passed through the sky, an Acroyear infant--one of twins--was born. This infant was chosen as their future king, and he was named Acroyear, as a representative of his people. (Micronauts I#30 (fb)) <15 or so years before the main story> - Time Traveler summoned Aquon of Seazone, taking him beneath the waves--despite the efforts of Aquon's father, Tybalt--and causing his family to believe he had been slain. (Micronauts I#30 (fb) - BTS) - Time Traveler transformed Aquon into a mer-man, and then gave him one of the three Keys to the Enigma Force, warning him of the upcoming destruction of Seazone. Aquon began using the key to secretly transform other Seazoners--captured by the monstrous aquatic leviathans he controlled--into mer-people to survive underwater. (Micronauts I#32 (fb) - BTS) - A second Key to the Enigma Force was given to Queen Fria of Polaria in the Subzero Zone. As Homeworld's suns burned brighter over Subzero zone, Fria lacked the will to use the Key to save her people or her kingdom. She began to secretly transform into a snowbear, and a legend somehow developed that whoever slew the snowbear would save his kingdom, yet lose that which he held most dear. (Micronauts I#33 (fb)) - Time Traveler traveled to the city of Mirthria in Homeworld's Tropica, giving the Devils the third Key to the Enigma Force to safeguard it. He told them that whoever claimed the Key would know happiness which surpassed all understanding. However, the Devils--who sought happiness for all--did not want to claim the Key, because it would make a Devil actually unhappy if everyone were less happy than himself. To this end they hid the key beneath a giant cup and played the "shell game" with other cups, to occupy themselves so they wouldn't claim the Key. (Micronauts I#8 (fb)) - As the social order on Homeworld collapsed--a result of Baron Karza selling immortality--the Enigma Force manifested as Time Traveler to Homeworld's king (Argon and Mari's father). The Traveler predicted that the Royal Family would fall--to one day rise again. (Micronauts I#7 (fb)) - As Arcturus Rann and Biotron passed beyond the farthest star, they reached a barrier, the Spacewall. The starship Endeavor began to travel faster than her engines were capable of, defying physical laws. Rann and Biotron detected glowing ethereal figures (Time Travelers) in the lifeless void. The figures smiled and flooded data into Biotron's collectors--questions and answers--as time seemed to stand still. Awareness swept over Rann and Biotron in almost physical waves and the figures seemed to speak the words: "Welcome to the Enigma Force!" With the words came a burning knowledge that branded their minds like fire, and a permanent telepathic link was formed between Rann and Biotron. Terrified, Biotron regained control of their ship and set a course to return to Homeworld. Also on Spartak, the new friends Acroyear and Bug escaped Karza's gained victory in and survived the arena of death with the aid of another Shadow Priest. 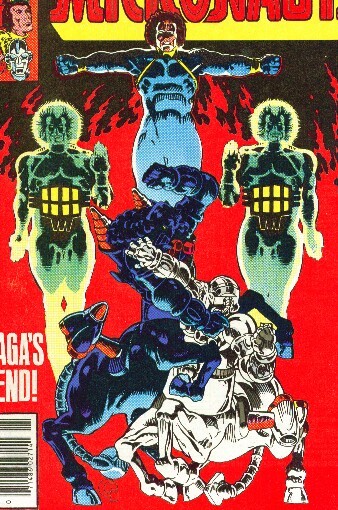 (Micronauts I#1) - As Argon and Mari hid out from Baron Karza' Dog Soldiers, Argon summoned the Enigma Force, and a Time Traveler appeared before them. However, the Dog Soldiers ambushed and captured them before the Enigma Force could be harnessed. Later, as Arcturus Rann, Bug, and Acroyear fought Karza's Deathtank, Time Traveler manifested before Rann, instructing him that it was now time to make good his escape (just as the underground set off explosive charges that rocked the stadium, creating a distraction). After Marionette invoked the names of Dallan and Sepsis, the Traveler explained that those two (Rann's parents) had been the first to defy Karza, that they had paid for their folly in the Body Banks, and that they had since been deified as symbols of the resistance. The freshly formed Micronauts then fled Homeworld, breaching the Spacewall and entering the Earth dimension. (Micronauts I#8 (fb) - BTS) - Baron Karza secretly feared Arcturus Rann, within whose mind lay the secrets of the Enigma Force. (Micronauts I#2) - Time Traveler appeared before the Micronauts, explaining to them that the Spacewall had been breached, and that it could not be repaired. He further informed them of a galactic cruiser pursuing them before bidding them farewell as they crashed on Earth. (Micronauts I#3) - Time Traveler appeared aboard the H.M.S. Endeavor, informing the Micronauts that Shaitan's fleet was tracking them via a device planted aboard their ship. He further questioned how Karza would react to learning of the existence of other universes beyond the Microverse. (Micronauts I#6) - After Ray Coffin and Professor Prometheus passed through the Prometheus Pit, Time Traveler transported Ray Coffin away and introduced himself to Coffin. (Micronauts I#7 (fb) - BTS) - Time Traveler told Ray Coffin of the war with Karza, who was taking the battle to Earth. (Micronauts I#7) - Time Traveler told Ray Coffin that Earth needed a champion against Karza and asked Coffin if he would fight for his planet. Despite Coffin's uncertainty about how he--a retired astronaut--could be a hero, Time Traveler smiled, recognizing heroic stock when he saw it. (Micronauts I#8) - After Karza left Homeworld and accessed Earth via the Prometheus Pit, one of the Shadow Priests revealed their secret purpose to the rebellion, sharing also that both of their prophecies had come true: Karza had left Homeworld, and Arcturus Rann had returned to Homeworld (though both were currently on Earth). Inspired by this, Prince Argon took up the role of rebel leader Force Commander. Time Traveler inspired Ray Coffin, telling him that the blood of heroes ran in his veins, and Coffin accepted his offer to become a hero. Coffin was infused with the Uni-Power, transformed into Captain Universe, and sent to Earth, where he battled Karza. Karza had initially felt himself so powerful that he was willing to slay Arcturus Rann, feeling that he no longer needed the Enigma Force. After fighting Captain Universe, however, Karza decided that he needed to learn the location of the source of the Enigma Force that he might destroy it so it could never again be used against him. 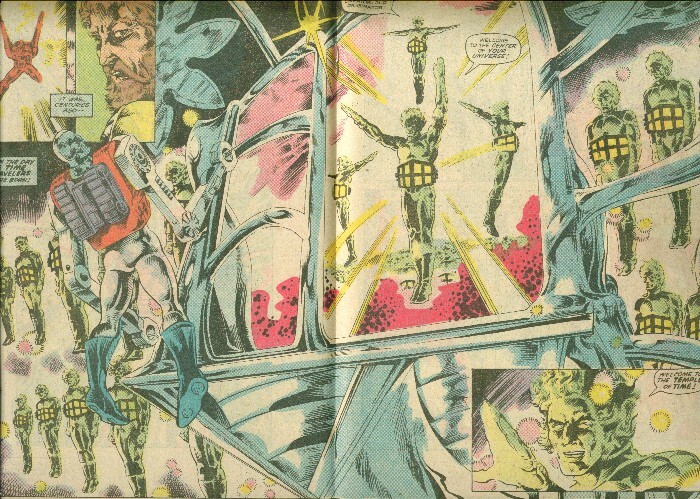 The Micronauts ultimately led Karza back into the Microverse, after which Time Travelers appeared and sealed the Prometheus Pit to prevent its further use. They then prepared for their confrontation with Karza and withdrew the Uni-Power from Ray Coffin, returning him to normal. (Micronauts I#9 - BTS) - As Acroyear--alongside the Micronauts--returned to his people on Spartak, breaking their forced (thoughtwashed) alliance with Karza's forces, Karza commented that the Enigma Force had outmaneuvered him as if he were a novice. On Homeworld, Force Commander led the rebels against Karza's Dog Soldiers. As Karza's forces assaulted Spartak, the Micronauts and Acroyear warriors rallied against him. Karza quickly dropped Arcturus Rann, while Acroyear merged with Spartak's Worldmind. (Micronauts I#10) - Karza captured Marionette and defeated Bug, but Acroyear--merged with Spartak's Worldmind--used the planet itself to decimate Karza's forces. Joined by Biotron and Microtron, the Acroyears finished off the Dog Soldiers. On Homeworld, the Shadow Priests armed those freed from the Pleasure Pits to join the rebellion, but the rebellion itself was discovered by Karza who returned to Homeworld. Time Travelers spoke, noting that all players were playing their parts and events prepared for the final meeting with the Enigma Force. (Micronauts I#11) - On Homeworld, Argon/Force Commander challenged Karza, but swiftly fell before him. However, the battle forced Karza to reveal the extent of his power and to buy the Shadow Priests time to prepare themselves. The Priests then acted, freeing Marionette and Arcturus Rann, and then shedding their robes and revealing themselves to each be Time Travelers (or perhaps to each be filled with the Enigma Force, which transformed them to resemble Time Travelers). They then activated their power with Rann: Having lived through a thousand years--even in suspended animation, Rann had been born anew into the timestream. The Enigma Force collected the infinitude of individuals arising from that first man into a single collective whole. The net result was a harnessing of an enormous, hitherto unknown power, a rebirth of something more than human, an x-factor. Karza attacked Rann, who now was Time Traveler/Enigma Force. Though the Traveler took a little time to get acclimated to this existence, it soon mastered the strangeness of its metamorphosis. Harnessing its power, the Traveler breached Karza's force field and forced Karza from battle Centaurion to human form. Karza fought back with all his power--derived from the fiery core of Homeworld, but the Traveler condemned Karza, striking him down and telling him it was the spirit and power of all the prayers and dreams of the Microverse for the past 1,000 years and more; it was the hope of Dallan and Sepsis Rann for a better world; the love of Ray Coffin and his son, Steve; the nobility of Princess Mari and Prince Argon; the comradeship of Arcturus Rann and Biotron; it was the light Karza had sought to banish to eternal darkness. Recognizing he could not overcome the Enigma Force, Karza attempted to blunt its victory by summoning forth the vast power from the pit into the heart of Homeworld. This would unleash a massive mindshock capable of destroying Karza, Homeworld, and possibly the Enigma Force as well. The Traveler attempted to bind Karza's power, but instead Karza was struck by a force from within Homeworld's core, which hurled his energy-persona down into the pit, apparently to be consumed by his own murderous mindshock. Only Karza's empty armor remained. The Acroyears then arrived and helped route the remaining Dog Soldiers, after which the Traveler--with the darkness having passed--relinquished Arcturus Rann's form as it traveled out into space. As it vanished, it told Rann that he would always be one with the Enigma Force. (Micronauts I#12) - Time Traveler peered through the Spacewall, observing as Col. Macey found one of the Acroyears stored in H.E.L.L. ; then over to Daytona Beach, looking in on the re-bonding of Steve and Ray Coffin; and lastly into a S.H.I.E.L.D. facility as Fury dispatched Agent M to deliver a package (deceased Acroyears and a damaged ship) to the Fantastic Four. Returning his gaze to the Microverse, he watched as Acroyear slew his brother Shaitan in mortal combat, and then observed Bug arriving on Kaliklak. (Micronauts I#14) - Time Traveler watched as Agent M arrived at the Baxter Building. (Micronauts I#15) - Time Traveler was still watching as the Invisible Woman, Mister Fantastic, and the Thing used the Reducta-Craft to travel to the Microverse, knowing that they would encounter and battle Psycho-Man. (Captain Universe/Hulk (fb) - BTS) - The Uni-Power transformed Gilbert Wiles into Captain Universe to stop a plane hijacking. (Marvel Spotlight II#9 - BTS) - The Uni-Power transformed Steve Coffin into Captain Universe to defeat Mister E.
(Marvel Spotlight II#9 - BTS) - The Uni-Power transformed Clare Dodgson and Ann Stanford into Captain Universes to defeat Nemesis. (Marvel Spotlight II#9 - BTS) - The Uni-Power transformed Monty Walsh into Captain Universe to defeat Guido Carboni. (Micronauts I#21/2) - Time Traveler observed on Spartak as the Faceless Priests--agents of Karza--resurrected Shaitan. (Micronauts I#22/2) - Time Traveler watched on Homeworld as Argon fell under Karza's control, which he revealed to Slug. (Micronauts I#23/2) - Time Traveler witnessed Argon bringing Slug to Shaitan, as well as the subsequent attack on them by the Desert Demons of Aegypta. (Micronauts I#24/2) - Time Traveler viewed the battle between the Desert Demons and Argon's forces, in which Prince Pharoid led the rescue of Slug, after which the Desert Demons brought her to Aegypta. (Micronauts I#25/2) - Time Traveler monitored Pharoid's revelation of Karza origins, fearing that the forces of darkness threatened to bind even him (Time Traveler). &nsbp;In Primal Zone, Karza forced Argon to leap into a lava pit, allowing Karza's mind to travel up from the planet's core and possess him. (Micronauts I#25 (fb) - BTS) - Karza's mind was able to reach across the Spacewall to Earth. The heightened mental abilities of S.H.I.E.L.D. 's ESPer agents only made them more susceptible to a more powerful mindforce, and Karza took control of the ESPers. (Micronauts I#25 (fb)) - Hydra agents broke the Fixer and Mentallo out of S.H.I.E.L.D. prison, commanding Mentallo to secretly probe the minds of S.H.I.E.L.D. ESPer agents. He learned that they were under the control of Baron Karza. (Micronauts I#25 (fb) - BTS) - Hydra was most interested in Karza. (Micronauts I#25) - Rann's telepathy began to increase--indicating that the Enigma Force was with him again, which in turn indicated that times of gathering darkness were approaching--and he was able to telepathically sense the presence of the Fixer and Mentallo. After Mentallo's capture, Rann probed his mind and learned that Karza yet lived, but Mentallo was incapacitated by a psychic assault from Hydra. (Micronauts I#26) - Rann discovered and attempted to sever the psionic siphons emanating from the Microverse, but he proved too slow. Karza, Shaitan, and the Faceless Priests transported themselves to Earth, and Karza instantly grabbed Rann's head, psychically tearing the secrets of the Enigma Force from within his mind. Karza then mentally bound the Enigma Force to prevent it from being used against him. Karza blasted Marionette with the intent of reducing her to atoms, but she was instead transported back to the Microverse. (Micronauts I#26 - BTS) - Karza trapped several Time Travelers, draining the power of the Enigma Force from them into himself. (Micronauts I#27 (fb)- BTS) - Using the ESPers power as well as the Enigma Force drained from Time Traveler, Karza took control of minds on both Earth and the Microverse with a predilection for evil. (Micronauts I#26) - Marionette she met with the leaders of various races to discuss Karza's threat. However, when she tried to contact the Shadow Priests for advice, she instead was shown an image of the Time Travelers bound by Karza. (Micronauts I#27) - As Karza tormented Shaitan, he demonstrated a Time Traveler under his control. He later taunted Time Traveler himself, asking if his energy-feeders caused him pain. The Traveler remained mute, and Karza could not read his mind, but he continued to drain off his power nonetheless. Sensing Karza's presence in Florida, Rann led the Micronauts and SHIELD there to oppose him, but efforts to reestablish contact with the Time Traveler proved futile. Using the power of the Enigma Force, Karza attacked Rann, toying with and eventually capturing him, placing him within similar bonds and draining the Enigma Force through him as well. Infuriated by Karza's betrayal and harsh treatment of him, Shaitan activated Karza's interdimensional portal. (Micronauts I#28) - Karza continued to drain the Enigma Force from Time Traveler and Rann, using it against his enemies, but Acroyear harnessed the power of Spartak's worldmind and, aided by the distraction of Queen Esmera's suicide sting, shut down Argon's mind, driving out Karza and allowing the Enigma Force/Time Traveler to escape. Rann's mind was shut down by the stress of having the Enigma Force torn from it. (Micronauts I#30 (fb) - BTS) - With Rann's link to the Enigma Force severed, the brain patterns on which the Time Travelers were based were erased from his mind, and the Time Travelers ceased to exist. Still, they left behind a warning of impending danger, the image of the obelisk within Rann's mind. (Micronauts I#33 (fb) - BTS / Micronauts I#35 (fb) - BTS ) - With the Enigma Force dormant, the Whirldemons were released from their imprisonment in Deadzone. (Micronauts I#29 - BTS) - Doc Samson found that Rann's two cerebral hemispheres had been functionally separated by an anatomic barrier as a result of the recent stress, and he shrunk down the Micronauts and sent them into Rann's mind to pierce the barrier. Wishing to access the slumbering right side of Rann's brain (which contained the key to unlocking the Enigma Force), Nightmare attempted to stop the Micronauts, but they succeeded in breaking down the barrier and reviving Rann. Within Rann's brain, the Micronauts observed an image of the obelisk. (Micronauts I#30 - BTS) - The obelisk was found in India's Indus valley (at the site of the ancient city of Bahawalpur) by archeologist Dr. Martin Vandenburg's expedition, and Dr. Strange located Vandenburg to study the obelisk. Meanwhile the Micronauts resolved that in order to stave off the time of impending darkness, they must find the three keys and use them to contact the Enigma Force. The Micronauts traveled to Seazone, where they observed the struggles between Lady Coral of Seazone and the people of Oceania. Rann and Mari met Aquon, recognizing that he held one of the three Keys to the Enigma Force. (Micronauts I#31 - BTS) - Dr. Strange sent his astral self to view the ancient past, observing the Sword in the Star transforming Wayfinder and his people and sending them to the Microverse. Unaware of the true nature of Oceania, Coral led an assault on the city. As Seazone collapsed into the sea, Aquon used his Key to the Enigma Force to transform the rest of Seazone into mer-people, who went to live in Oceania. The Micronauts were initially transformed into mer-people as well, but after things had settled down Aquon reverted them to normal. The crisis resolved, Aquon gave the Key to Rann that he might use it to awaken the Enigma Force. From his self-exile on barren Spartak, Acroyear observed the Herald Comet, and he followed it in his ship, hoping it would lead him to his destiny. He also hoped to learn why he had been chosen for the fate of destroying his own world. (Micronauts I#32 (fb) - BTS) - Seeking to save Polaria, Prince Peacock began stalking the snowbear, not realizing that the snowbear was Fria. Both Fria and Peacock kept their love for the other a secret. Fria never told Peacock about the Key, and hence he never had the chance to help her use it. (Micronauts I#32) - Seeking to learn the secrets of Wayfinder and the Sword in the Star, Dr. Strange magically passed through the spacewall and traveled to the Microverse. Time Traveler deflected Peacock's arrow, and the snowbear Fria was only wounded in the shoulder, though she kept this injury hidden from all. Ultimately Peacock slew the snowbear, learning too late that it was Fria. Despondent over how Polaria had made its people grow emotionally cold, Peacock refused to use the Key to save Polaria. He gave the Key to Rann, who couldn't use it to save Polara, but he did use it to save the Micronauts from a frozen cavern in which they had become trapped. The "Herald Comet" generated a burst of light that sent Acroyear careening off course of following the comet, and he crashed on Homeworld's Tropica. (Micronauts I#33) - In the city of Mirthria, one of the Fireflytes led Acroyear to uncover the third Key, which the Devils had so feared. One of the Devils tried to stop him, but their fight shattered the third giant cup, releasing a pre-recorded message from Time Traveler, as well as the third key and numerous other Fireflytes (released from the vestige of the Enigma Force in the Travelers' message). The Key restored the sight of the temporarily blinded Acroyear. The Devil and Fireflyte joined Acroyear in heading to Dead Zone to use the Keys to unlock the Enigma Force. Dr. Strange arrived in Deadzone, and Whirldemons began to coalesce behind him. (Micronauts I#34) - The Micronauts returned to Aegypta with all three Keys, but they were captured by Argon's Dog Soldiers as their newest member, Pharoid, turned on them under Argon's orders. Realizing his error after Argon (who had been corrupted by his experiences with Karza) showed his true colors, Pharoid helped the Micronauts escape. Overpowering Argon and his troops, the Micronauts reclaimed the Keys to the Enigma Force and headed off to Dead Zone. Recovering, Argon led his troops in pursuit of the Micronauts. Dr. Strange approached the tomb of Prince Wayfinder but was captured by one of the Whirldemons. (Micronauts I#35) - The Micronauts arrived in Deadzone, and Fireflyte used her Enigma Force-derived powers to free Strange from the Whirldemon. The demons attacked in an effort to prevent Rann using the Keys to awaken the Engima Force. Argon and his forces showed up, and Argon convinced the Whirldemons to join forces with him, making the deal that they would be given dominion of Earth and Argon would rule the Microverse. Despite the efforts of his enemies, Rann inserted the Keys into Wayfinder's tomb, unlocking it and revealing the Sword in the Star. The Sword merged Rann and Strange and imbued them with the Uni-Power; as Captain Universe, they unified and strengthened the Spacewall separating the Earth dimension and the Microverse, preventing the two universes from merging and annihilating each other. The Unipower then returned to the Enigma Force, while Fireflyte used the last of her power to bind the Whirldemons for all eternity, dying in the effort. The Enigma Force was restored, though the connection to Rann apparently remained lacking. (Incredible Hulk Annual#10 - BTS) - The Uni-Power transformed Bruce Banner into Captain Universe to defeat Jamie Custer. (Micronauts I#36 - BTS) - The Micronauts were somehow shunted to Earth again while fleeing Argon's forces, and Argon's Death-Squad pursued them. (Micronauts I#37 - BTS) - Huntarr breached the Spacewall to assault the Micronauts under Argon's orders. (Micronauts I#39 (fb) - BTS) - Huntarr again breached the Spacewall, returning to the Microverse. (Micronauts I#39) - Argon convinced Cilicia to send the Acroyear Elite across the Spacewall in an effort to slay Acroyear for his perceived betrayal in bringing about the death of Spartak's worldmind. Unable to slay Acroyear, the Acroyears instead drained the the power from the Micronaut's ship, the Endeavor, but Acroyear disabled their ship so that it shattered against the Spacewall when they attempted to return to the Microverse. (Micronauts I#40 - BTS) - Argon sent an army of artificial Antrons--created in the Body Banks--across the Spacewall to Earth, where they consumed Reed Richards' Reducta-Craft, eliminating one more route of passage back to the Microverse for the Micronauts. (Micronauts I#41 - BTS) - Commander Rann began to regain some of his telepathy--and perhaps his connection to the Enigma Force--and he sensed those within the city Liddleville. (Micronauts I#42 - BTS) - The Micronauts battled Dr. 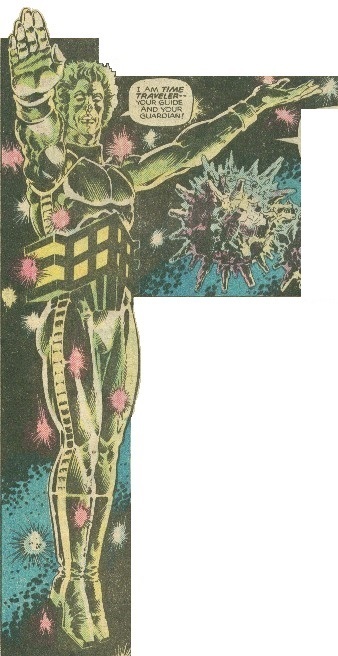 Nemesis, whose ability to shrink objects and beings "out of existence" sent Marionette, Bug, Acroyear, and Nemesis himself through the Spacewall and into the Microverse. (Micronauts I#43 - BTS) - While the three shrunken Micronauts arrived on homeworld, Dr. Nemesis continued shrinking, phasing beyond the Microverse as well. (Marvel Super-Heroes: Contest of Champions#1-3 - BTS) - The Uni-Power transformed an unidentified woman into Captain Universe. (Micronauts I#49) - The Bioship (carrying Commander Rann and Devil) shrank and accessed the Spacewall, spending some time within it and observing the lifeforms that existed within it. The Bioship eventually merged with the Spacewall and then accessed the Temple of Time, where the Time Travelers dwelt. Rann asked the Travelers to again grant him the power of the Enigma Force that he might defeat Force Commander, but the Travelers refused, stating that they now devoted all of their energies to preserving the Spacewall and preventing the Microverse and Earth's universe from annihilating each other. The Traveler told Rann that in order to defeat his enemy he would have to find the Enigma Force within himself. (Micronauts I#50 - BTS) - After Karza had defeated the Micronauts, Fireflyte used her song to distract him from killing them, giving her time to teleport them away. (Micronauts I#51 - BTS) - While the rest of the Micronauts stopped fleeing to destroy the Dog Soldiers pursuing them, Rann went into isolation, using Fireflyte's song to meditate so that he might commune with the Enigma Force again to try to convince it to assist him against Karza. (Micronauts I#52) - Rann accessed the Temple of Time and again tried to convince the Time Travelers to aid him against Karza, but they merely showed him that they were neither good nor evil but rather beyond such concepts. They offered to allow Rann to transcend mortal morality, but he realized that then he would not care about stopping Karza either. After contact with the Travelers was broken, Rann decided to try again to convince them to give him the power of the Enigma Force. (Micronauts I#53 - BTS) - Rann continued his meditation with Fireflyte's aid, seeking to again commune with the Time Travelers. (Micronauts I#55) - Rann again accessed the Temple of Time, but found Karza had beat him there. Karza offered a truce to the Time Travelers, vowing to bring order to the Microverse if they would stay out of the coming battle. Rann tried to convince them that they must help defeat Karza. (Micronauts I#56) - The Time Travelers granted both Rann and Karza the power of the Enigma Force, with Rann taking the form of Captain Universe. They quickly realized that with the power of gods in their hands, they would lose all interest in their mortal concerns, and both men rejected the power. Rann and Karza returned to the physical world. (X-Men/Micronauts#1-4) - Both Karza and the Micronauts breached the Spacewall, traveling to Earth and joining forces with the X-Men against the Entity. (Micronauts I#58 (fb) - BTS) - Karza returned to the Microverse. (Micronauts I#58) - With the aid of Fireflyte, the Micronauts returned to the Microverse, though at the same time the Time Travelers began to seal the Spacewall to prevent any further Earth-born contamination--such as the Entity--from again threatening the Microverse. The Micronauts made it across in time, though Fireflyte perished from the effort (only to be reborn soon after as Devil). (Micronauts II#19 (fb) - BTS) - Baron Karza re-created the Prometheus Pit, this time designed to punch though the Makers' barrier that held the power of the planetoids in check so that he could take that power for himself. Upon completion, he had similar Pits built on each of the planetoids of Homeworld. (Micronauts I#58-59 - BTS / Micronauts II#16 (fb) - BTS) - Baron Karza used the power derived from the Prometheus Pits to slaughter all life on Homeworld, tearing a gaping wound in the planet's worldmind. Karza was slain in the subsequent battle with the Micronauts. Without life to soothe the wound, the worldmind went mad. This madness manifested itself as a searing pain, which began to spread across the Spiral Path. The pain corrupted the Enigma Force itself, driving it mad as well, and the delicate life-like structure of the Microverse was threatened. (Micronauts II#10) - Having bypassed the Spiral Path via the flight of a Child of the Makers, the Micronauts traveled to the other side of the Spacewall. Rann's efforts to commune with the Enigma Force yielded a sense of deadness--and a roaring pain, a crushed laughter in the midst of the deadness--where there should have been peace. With the aid of the Children of the Dreaming Star, their power channeled by Rann's mind, the Micronauts began to breach the Spacewall . A Time Traveler appeared and forbade them passage. Disturbed by the corrupted Time Traveler, Rann ordered the entire fleet of the Children of the Dreaming Star to attack it. The assault proved futile, and the Traveler then destroyed most of the Children's fleets. After the Traveler disappeared, Rann returned to his ship, greatly aged by his experiences. (Micronauts II#11-12 - BTS) - The fleet of the Children of the Dreaming Star returned to the Confluence of Stars, and the Micronauts located the Breachpoint, an immense and ancient structure built by a long-dead race, but the Enigma Force caught up to them and destroyed Breachpoint before they could utilize it. 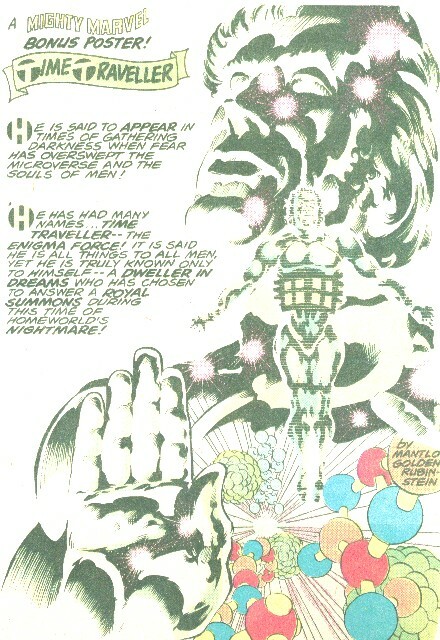 The being known as Scion then confronted the Micronauts, convincing them to locate a fold in the Spacewall, far down the spiral path, through which his power allowed them to pass. (Micronauts II#13 - BTS) - Scion led the Micronauts to the planet Fiame, where they found a ship which they accessed via the glyphs burnt into Microtron by the laser planet. Within the ship they found a pylon marked with the glyphs of the three Keys to the Enigma Force. When the glyphs on Solitaire's necklace were pressed against the glyphs on the pylon, the Micronauts were spoken to by the ship's owners, the Wanderers. To ensure that the design of the Makers not perish, Scion claimed the glyphs of the Keys to the Enigma Force (or the Keys themselves), taking up their power and the promises that they represented. Armed with them, Scion intended to save the Microverse. (Micronauts II#14 - BTS) - Scion revealed the Keys to the Enigma Force as glyphs from the language of the Makers, part of the code which embodies the power they used to create the Spiral Path. (Micronauts II#18 - BTS) - Rann told the Micronauts that he had learned from the Makers that the Micronauts would have to sacrifice themselves to save the Microverse. The Acroyear fleet then arrived, intending to destroy Homeworld to end the Pain, but Scion altered their controls so that they merely severed the columns connecting the individual planetoids of Homeworld, sending the planetoids to "their necessary positions". (Micronauts II#19 - BTS) - Rann then showed the Micronauts how they could use the Prometheus Pits to make the spheres--now spread across the Spiral Path--to serve as a blockade against the advance of Pain and fear. Scion further revealed that the Micronauts' recent experiences had changed them into Prime Beings like himself and Solitaire. They would each give birth to life on one of the former planetoids of Homeworld, and that that life would grow out of the Pain that assailed the Microverse. Each cell in their bodies would become a seed sown over the world and a refutation of the power of Pain. Scion then led the Micronauts into one of the Pits, but they were assailed by defense mechanisms, as the Pits were designed only to follow the commands of Karza. Rann rushed to don a suit of Karza's armor, after which the Pits obeyed his orders. Scion, Bug, Fireflyte, Acroyear, and Huntarr all entered the pits. Rann and Marionette stayed behind to control the instrumentation. (Micronauts II#20) - As the raging mad Enigma Force spread the wave of pain and madness across the Microverse, Marionette and Rann joined Scion, Bug, Fireflyte, Acroyear, and Huntarr in sacrificing themselves to form new life across the former planetoids of Homeworld. Their life energies became a force of hope that contained the Pain of the Microverse, allowing life to begin again. Apparently the Spacewall became less of an obstacle following the resolution of the pain/madness. (Marvel Fanfare I#25 - BTS) - The Uni-Power transformed Delayne Masters into Captain Universe to oppose Willie Johnson. (Web of Spider-Man Annual#5 (fb) - BTS) - The Uni-Power transformed a number of different beings into Captain Universes at various points in time. (Web of Spider-Man Annual#5 - BTS) - The Uni-Power transformed Evan Swann into Captain Universe to oppose the Quantum Mechanic. (Spectacular Spider-Man II#158-Amazing Spider-Man#329 - BTS) - The Uni-Power empowered Spider-Man with cosmic power, eventually enabling him to achieve the Captain Universe identity to oppose the Tri-Sentinel. (Web of Spider-Man Annual#6 - BTS) - The Uni-Power transformed Eddie Price into Captain Universe to oppose the demons Gart and Rath. (Guardians of the Galaxy#30-33 - BTS) - The Uni-Power transformed the Badoon L'Matto into Captain Universe to stop the Guardians of the Galaxy from altering history. (Marvel Comics Presents#148 - BTS) - The Uni-Power transformed Elijah Jackson into Captain Universe to save his daughter from attackers. (X-Men/Captain Universe#1 - BTS) - The Uni-Power transformed Jeff Christiansen into Captain Universe to oppose Roger Fieldston. (Cosmic Powers Unlimited#5 - BTS) - The Uni-Power transformed Roland Taylor into Captain Universe, leading to his pursuit by Division U and the Enigma Hunters. (Small X-Pectations - unpublished/non-existent (see comments)/ Captain Marvel V#6 (fb) - BTS) - A reborn Baron Karza joined forces with Thanos in an effort to destroy all "subatomic realities." The X-Men and Micronauts joined forces to stop their efforts, with the ultimate resolution being a massive release of energy that merged all of these realms into a single dimension. The effects of this restructuring of the Microverse upon the Enigma Force are unclear. (Amazing Fantasy II#13 - BTS) - The Uni-Power transformed Ted Simmons into Captain Universe, but power fluctuations resulted in injury to a policeman. (Amazing Fantasy II#14 - BTS) - The Uni-Power began a quest to understand its power fluctuations, initially beginning by seeking out those who were already superhuman so that it could duplicate their powers. (Captain Universe/Hulk#1 - BTS) - The Uni-Power possessed Bruce Banner and sought out Gilbert Wiles--who was still researching the Uni-Power, and he attempted to help the Uni-Power. AIM agents sought to usurp the Uni-Power, and it transformed the Hulk into Captain Universe. During the battle, an invisible AIM agent killed Wiles business partner, David Garrett, framing Wiles. (Captain Universe/Daredevil#1 - BTS) - The Uni-Power joined with Matt Murdock/Daredevil to help clear Wiles' name. (Captain Universe/X-23#1 - BTS) - The Uni-Power joined with X-23 to locate and destroy the research A.I.M. had performed on it. (Captain Universe/Invisible Woman#1 - BTS) - The Uni-Power sought aid from Reed Richards, but they were then attacked by Gladiator (Kallark) of the Shi'ar Imperial Guard who had been sent to destroy it (as it was seen as a threat to the universe). It joined with the Invisible Woman and then eventually Gladiator, helping them stop a tidal wave and convincing Gladiator to take it back to the Shi'ar to help learn the reason for its power fluctuations. (Captain Universe/Silver Surfer#1 - BTS) - The Gladiator and Uni-Power were ambushed by Krosakis, who fed on its cosmic energies and forced it to bind with him. The Silver Surfer freed the Uni-Power from Krosakis, and it then bonded with the Surfer to defeat Krosakis. After the Surfer temporarily halted its power fluctuations, the Uni-Power returned to Earth and bonded to Gabriel Vargas as its new long-term host while it continued to investigate its power fluctuations. Comments: Created by Bill Mantlo, Michael Golden, and Josef Rubinstein. I started out this profile to cover Time Traveler, but since the Traveler is virtually indistinguishable from the Enigma Force except by appearance, I expanded it to cover the Enigma Force, as well as events in the Microverse significant to the Enigma Force...and then its hard to separate that from the Uni-Power...what a mess...what a headache. I'll have to re-review this stuff and see if I can figure out how to gel the two origins of the Microverse and the two origins of Time Traveler. LMK if you've got any ideas. 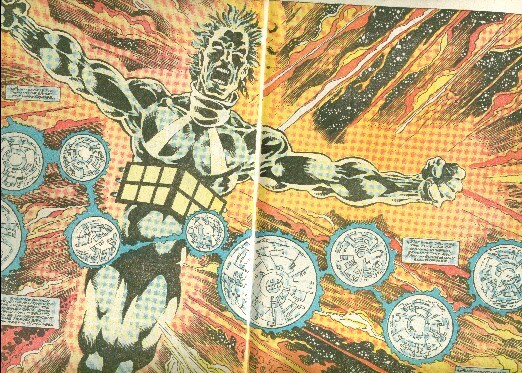 According to a featurette in Micronauts I#2, Time Traveler is said to appear in times of gathering darkness when fear has overswept the Microverse and the souls of men. He has many names, including the Enigma Force. It is said he is all things to all men, yet he is truly known only to himself--a dweller in dreams who had chosen to answer the royal summons during this time of Homeworld's nightmare! In Micronauts I#11, the Enigma Force (in the form of Time Traveler) describes itself as "The One and the Many, Man and Immortal, Micronaut and Time-Traveler!" In Micronauts I#27, Karza described the Time Traveler as purest power, a direct manifestation of the Uni-Power, the fundamental basis of all existence--the emissary of the Enigma Force which, once fathomed, makes all things known and thus liable to destruction. The Enigma Force is behind the scenes in every issue of the Micronauts, and Time Traveler presumably watched over everything, but I'm only including them where they were seen and/or directly or indirectly affected others. When Wayfinder and his people arrived on Earth, a little green dinosaur was seen in the background. That would normally mean they had to have landed before 65 million years BC, though it could be that they landed in the Savage Land. Quick comment regarding the Small X-Pectactions crossover mentioned in Captain Marvel V#6...it was never meant to be a published story. PAD did this just because he wasn't sure if some characters were in the same Microverse, so he made sure they were by ret-conning a story (really just a reference to said story) where the Microverses were all merged. In his Catalogue of Correspondences, Ian McNee listed the Enigma Force as the "Avatar Force" linked through supernatural connections to the Elder God Oshtur; by comparison, the Dark Force was listed as corresponding to Gaea, the Goblin Force as corresponding to Set, and the Phoenix Force as corresponding to Chthon. He made this list based on his reading of the First Tarot. I'm not going to cover all of the Captain Universe stuff here. See individual entries.